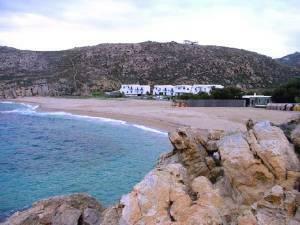 This is an idyllic cove situated between Super Paradise and Elia Beaches on Mykonos’ outstanding southern coast. The beach has lovely foliage surrounding the area, is seven kilometers from Mykonos Town, and is one of the beach stops for caiques departing from both Mykonos Town and Platys Yialos. It is one of the least organized beaches, and nearly all activities, except for night swimming, stop after sunset. This means that you must have private transport to enjoy the fervent nightlife of Mykonos Town. One is strongly tempted, though, to spend a peaceful night or two enjoying the far away view of the islands of Naxos and Paros glowing under a starry sky some miles away.